Bitesize Beo: How to Pass The Dread Of "I Should Study"
Annoucing Bitesize Beo 2017 live event! Do you have the dread of “studying”? There’s nothing worse than that feeling of “ugh, another week gone, and I really should have studied the Irish language” (or whatever language you’re interested in). You might be one of the many people who tried Bitesize Irish Gaelic, and then felt “ugh, I haven’t opened the lessons in a long time”. The Sunday afternoon is a good example. You promise yourself all week to “open up a book to study” on Sunday. Sunday rolls along, and you’re still recovering from the week. The last thing you want to do is “study”. You’ll see the presenters’ webcam (technicalities allowing! ), and their shared slides. You’ll have the chance to interact during every session: ask questions in the chat, and get answers. Share your experiences with everyone. This will be your event, that you can attend from your home. Maidhc O’Regan, fluent Irish language speaker. Born and raised in Chicagoland, Mike first encountered the Irish language when he began playing Irish traditional music in the early 1990s. Contact with the language through music lead him and his wife, Karen, to enroll in their first Irish class in 2001. One year of classes lead to another, and then another, as well as numerous language immersion weekends and a couple of short courses in the Gaeltacht. Mike began teaching intermediate-level Irish in Chicago for Na Gaeil in 2013. Siobhán Ní Mhaoildhia, Bitesize Irish Gaelic’s language assistant. She’s a native Irish Gaelic speaker, and has experience of teaching Irish Gaelic to people outside of Ireland online. Eoin Ó Conchúir, founder of Bitesize Irish Gaelic will help run the event. Eoin is a native Irish speaker, attended all his schooling through the Irish language, and has been sharing the Irish language online since 1995. Audrey Nickel is an Irish speaker, teacher, and singer who lives near Santa Cruz, California. She wandered onto the Irish Gaelic Translator Forum in January, 2004, and the rest, as they say, is history (her husband accuses her of singing in Irish in her sleep!). She is largely self-taught, and enjoys helping others discover how they can create their own “mini-Gaeltacht” and make the Irish language a part of their daily lives, even if they don’t live in Ireland. Maidhc O’Regan will describe the habits and techniques for mastering the Irish language. Siobhán Ní Mhaoildhia will tell you how to get over the issue of dialects in Irish. Eoin Ó Conchúir will show you how not to let pronunciation of Irish Gaelic words stop you. Audrey Nickel will tell you how to immerse yourself in the language every day. Get a super motivation boost to continue your Irish language journey. You’ll feel the energy of our presenters, and their passion for the Irish language. Your level of the Irish language does not matter. As long as you’re interested in expressing yourself through the Irish language and in the culture of Ireland, you’ve got what it takes to register for this live event. Be part of the live event, asking questions in the chat section, and getting answers from the presenters. This will be your chance to ask questions, get live feedback, and not be afraid of asking “stupid questions”. Feel the community, because you’ll see that others are on the same journey as you. That’s very different to if you’ve been trying to learn a little bit of Irish Gaelic on your own, with no-one around you interested in doing that. Sign-up here to access all videos! Here’s your chance, don’t miss out! Purchase your place in the live event now. Access to the recording for a limited time afterwards, in case you were not able to attend in the end. Free gift! “The Secrets to Practicing Irish Gaelic Every Day” ebook PDF by Audrey Nickel. Are you already learning Irish? Then discover the 10 secrets to practicing the language every day. Delivered before the event. As we say at Bitesize Irish Gaelic, we’re not in the business of holding your money hostage. Didn’t like the event, and thought it wasn’t worth your time? Want to cancel your registration? Contact us through this site, and we’ll refund your money right back. If you put this off, you may never get really into your Irish language journey. When you’re brave and passionate enough to consider wanting to dive into Ireland’s culture, it’s still easy to get stuck. It feels like the problem is too big, and there’s not enough opportunity to try it out. 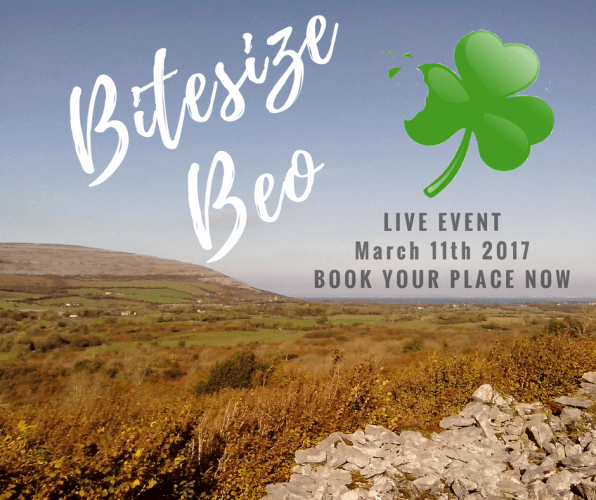 By simply attending this event, you’ll have a motivation, plus tips and techniques, to help you make Irish Gaelic part of your every day. P.S. The early bird pricing ends on March 1st 2017. Use the red “Add to Cart” button above to book your place now. P.P.S. Still have questions? No problem. 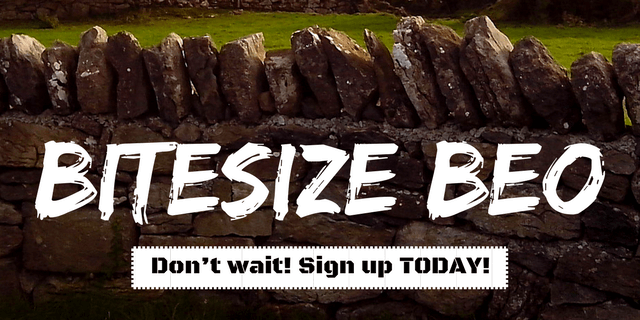 Either leave a reply below this blog post, contact us through our online form or email info@bitesize.irish . This sounds wonderful, and I would love to participate, but Medicare has seen to it that I have barely enough money for bills any more. Sorry I have not been able to keep up with studies, etc.. I have been care giver for our Senior Priest, and he has just recently passed from cancer. Haven’t been up to much since. Feel free to join us at our next event. We have sent you an email to your inbox to get more information about the mentioned issue.